Baby Rhino Forrest at Baby Rhino Rescue | Adopt and Donate Now! Forrest arrived at C4WA in August of 2013. He was five months old. His mother was poached in the Sabie Sands Nature Park, which borders the Kruger National Park. Forrest is known as “the sweet one” because he is completely without aggression. 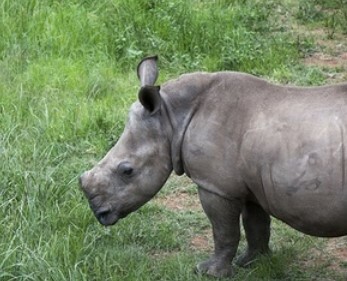 He is such a calm, good influence that Care for Wild Africa wanted to use him as a companion for a new rhino that had just been orphaned, but he is deeply bonded with Timbi and Olive and couldn’t be separated from them. Forrest is the rhino that always has time for a “hello” when he is let out of the night pen. Timbi, Olive and Hawk will often run into the outside enclosure, full of the joys of the morning, but Forrest will linger behind, giving the volunteers all his attention. He deeply loves Olive, Timbi and Hawk; they are his new family now and he is a happy and well adjusted young rhino. He loves his freedom, and the wide open spaces where he gets to graze during the day.